FSlint is a utility to find and clean various forms of lint on a filesystem. I.E. unwanted or problematic cruft in your files or file names. 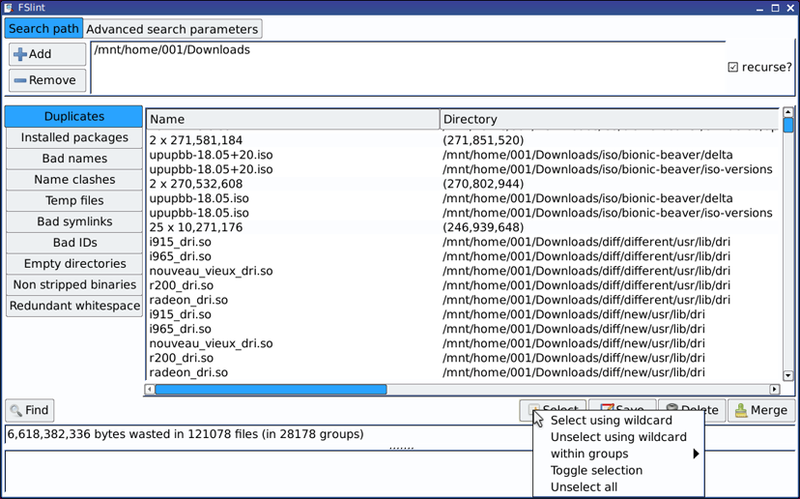 For example, one form of lint it finds is duplicate files. It has both GUI and command line modes. There is the problem with menu entry described here http://murga-linux.com/puppy/viewtopic.php?t=86746 which is automatically changed, so you need to change it after the installation. Thank you for the helpful application! Posted: Tue 01 Dec 2015, 05:26 Post subject: python needed ! rmlint is without. python needed ! rmlint is without. FSlint can be run either as a GUI or from the command line. Please see the link to the pdf manual at bottom of this post for details. FSlint is an excellent duplicate file finder and cleaner that is simple to use. I built this because I was having trouble getting the original package posted in this thread to run in a late model puppy. It will also run in puppy precise-5.7.1 using the devx. Navigate the menu on the left side of page. Its pretty amazing how many duplicates I have in my archived hard drives. The option to search recursively(top-right ticbox) is especially useful as I don't always want to look at all sub-directories when searching for duplicates. Take a glimpse at the FAQ and download the manual for specifics, this is simple to use or can be as complex as needed for identifying, merging, or deleting files. In the pic I posted there are over 6GB of duplicate files just in my downloads directory & subdirectories by searching only that directory recursively. Here is everything Fslint can find. Not to scare, just to warn against deleting stuff unintentially because once its deleted - its gone. Fslint has the potential to damage your puppy install if you tell it to delete important system files.